Can you believe Christmas is only a week away?? It came so fast! I have been looking forward to it for weeks now but I also want this time to slow down. I am pretty much done with my shopping but have to pick up a couple last minute items. Thank the Lord for Amazon and it's two day shipping! 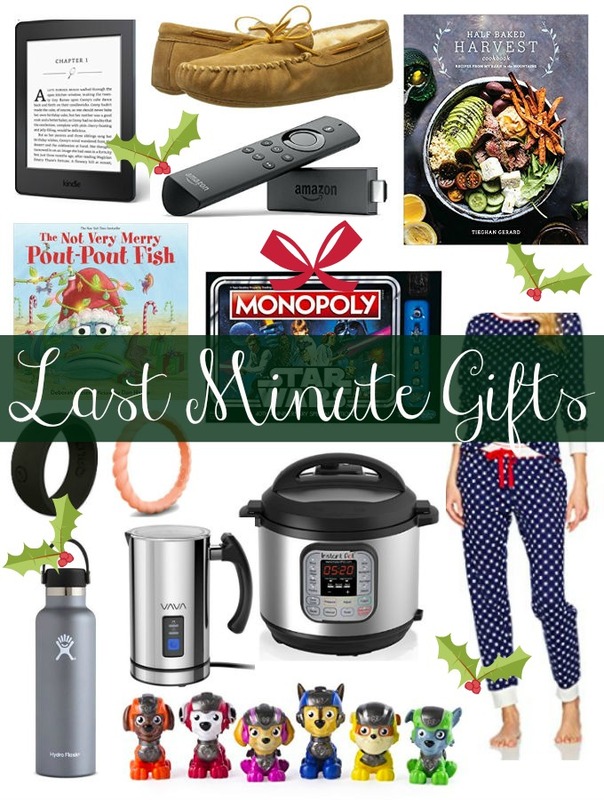 I have picked some of my favorite items from Amazon and I have something for everyone on your list. Kindle Paper white: Mark got me an e-reader several years ago and I LOVE it. I was hesitant at first to buy one for myself because I am such a purest when it comes to books. What I have found is that it's soooo nice to be able to instantly download a book when I want it. Plus it's less expensive. This is a great gift for anyone on your list! Moccasins: These slippers look so comfortable and are perfect for the man on your list. I know my hubby would love a pair. Half Baked Harvest: This cookbook is on my list this year and it was written by one of my favorite bloggers. The pictures look beautiful and is a great gift for the cook on your list. Amazon Fire Stick: We switched over to a Fire TV a few years ago and haven't looked back. It's so easy to use and I love that our Amazon, Netflix, and Hulu accounts are all in one place. The Fire stick is less expensive than the Fire TV and still does a ton. The Not Very Merry Pout Pout Fish: The Pout Pout Fish books are adorable and this one is no exception. This is a great stocking stuffer or a gift for a new mom! Star Wars Monopoly: I'm a huge fan of gifting games because it's something the whole family can take part in. Pajamas: My mom always gifts us pajamas on Christmas Eve and I know a lot of other people share in this tradition. If you haven't found the perfect pair yet, take a look at these. So cute! Qalo Rings: I talked about these rings in my Five on Friday post last week. My hubby wears one everyday and I always wear one when I workout. They are great! Instant Pot: I know that kitchen gadgets aren't the most romantic gifts but when they make our lives easier, I'm on board. I've had my eye on an Instant Pot for a long time and people swear by them! Milk Frother: A milk frother is an easy way to elevate your coffee and this one has great reviews. Hydroflask: This is my favorite insulated water bottle. They keep beverages super cold for 24 hours or even hot for 6 hours. Paw Patrol Mini Figures: Paw Patrol is seriously adorable and these little guys would be perfect for the kiddo on your list.